We have been looking forward to this Modern Jazz concert for some time! 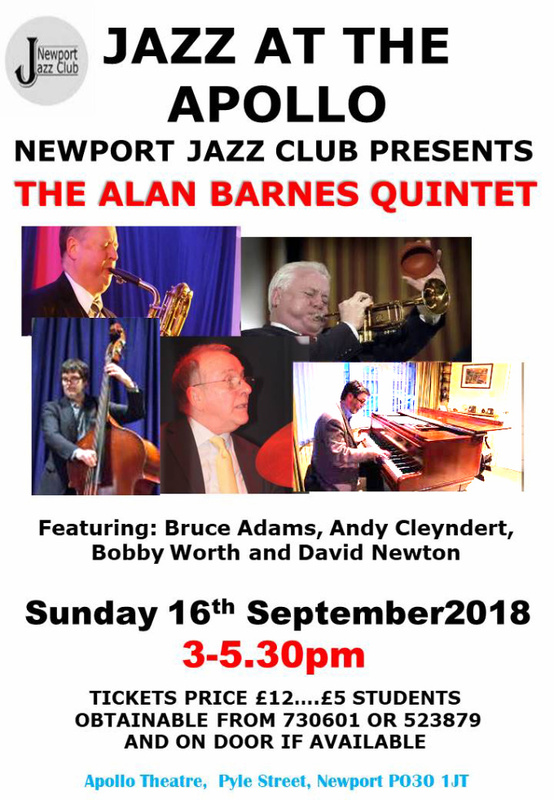 NJC presents the Alan Barnes Quintet. with Alan on saxes, Bruce Adams on trumpet, David Newton on piano, Andy Clyndert on bass, and Bobbie Worth on drums. This star studded line-up will give you top modern music as only they can produce and we know that Alan will entertain you greatly between numbers! Tickets as usual – £12, £5 students. It is recommended that you reserve your tickets to avoid possible disappointment by Email: w.g.wills@hotmail.co.uk or Tel: 01983 523879 or 01983 730601 or on door if available.